Defending champion Rafael Nadal and third seed Novak Djokovic remain on course for a semi-final showdown at the French Open. Djokovic beat home favourite Paul-Henri Mathieu 6-4 6-3 6-4 to reach the quarter-finals, before Nadal thrashed Fernando Verdasco 6-1 6-0 6-2. Nadal will next face Nicolas Almagro, who beat French wildcard Jeremy Chardy 7-6 (7-0) 7-6 (9-7) 7-5. Djokovic will play 19-year-old Latvian Ernests Gulbis in the last eight. Nadal went into the match against Verdasco with a 5-0 record against his fellow Spaniard and quickly demonstrated why. In a battle of two left-handers with huge forehands, Verdasco had nothing in his game to trouble Nadal and also struggled with a thigh problem. The three-time champion wrapped up victory in one hour 54 minutes. "I wish all my matches were like this one," Nadal said. "Here we don't want to have mercy for anybody." 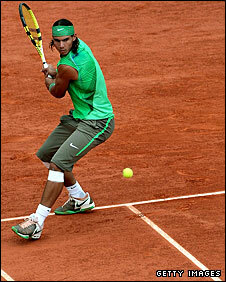 Nadal said of his quarter-final opponent Almagro: "He is a very good player. He has a beautiful serve, a very powerful serve. So I'll have to try and impose my rhythm, not let him take the initiative and make him run. "It is probably going to be my toughest match this week." World number three Djokovic was in fine form against Mathieu, with his serve particularly impressive. The Serbian saved seven of the eight break points he faced and was delighted with that part of his game. "I've been serving really well in all four matches and it's really encouraging for the future as it's something I want to have as a weapon," said Djokovic. "If I can rely on serve, then I'm relieved, you know, through the game. So then I can focus myself more on the baseline strokes. "I think I was focused a lot today. I used the momentum and just tried to be smart, change the pace a lot." Gulbis, the only Latvian ever to play in a Grand Slam, was rarely troubled en route to a 6-4 7-6 (7-4) 6-3 win over France's Michael Llodra. His previous best Grand Slam performance had been a run to the fourth round at the 2007 US Open. In Paris, he has already defeated Germany's Simon Greul, American seventh seed James Blake and Ecuador's Nicolas Lapentti. Gulbis now faces a huge challenge in the form player of 2008, Djokovic, who is a former training partner from the Munich academy. Llodra, one of five Frenchmen to reach the last 16, struggled to match the Latvian's impressive all-court game and, despite saving a match point in the eighth game of the third set, he was powerless in the next as Gulbis took victory. "Going into Roland Garros, I didn't think the French Open would be where I'd have my best Grand Slam result," said Gulbis, who skipped the Rome and Hamburg Masters in favour of extra practice. "But I practised well for three weeks and worked on my physical condition and I changed some tactics. "For example, one year ago I was playing some pretty stupid clay-court tennis. I'd go for winners when I didn't need to and it was more hard-court tennis." Gulbis, who as a virtually unknown 18-year-old knocked Tim Henman out of last year's French Open, added: "Now I play like a clay-courter and only go for winners when it's possible."